This is a step-by-step tutorial that you can follow to delete one of your clients from the records. Note: Please check carefully before deleting a client, as this action cannot be undone. 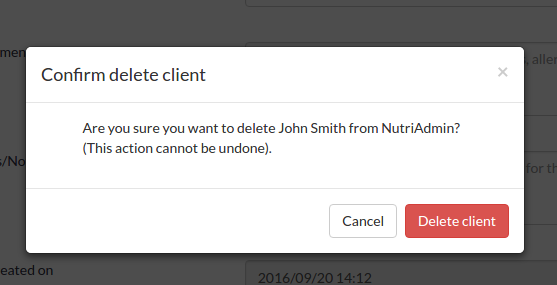 This method will just delete a client record, but other data for the client will remain in NutriAdmin. To learn how to completely delete all data associated with a client, please click here. 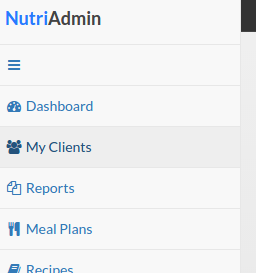 Step 1: Click on My Clients on the right-hand side menu. Step 2: Find the client that you want to delete in the table. Step 3: Click on Actions on the right-hand side of the table, then select Delete. Step 4: You will be prompted with a dialog box. To confirm that you want to delete the client, please click on the red Delete client button. The client record is now deleted and no longer exists.